Store your DVD's and movies inside of this Media Cabinet. 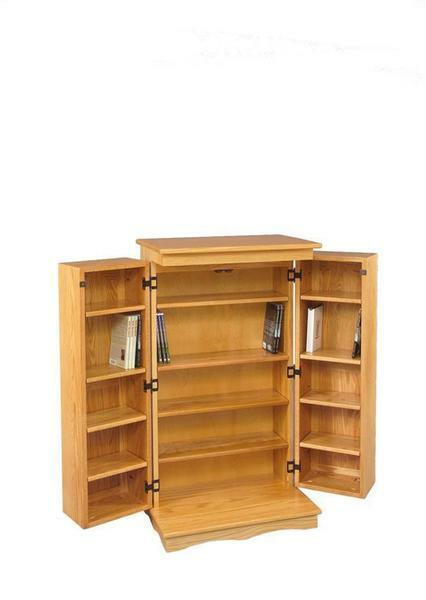 Each side of the Amish DVD Cabinet holds 52 DVDs or 160 CDs and the center holds 112 DVDs or 320 CDs! Your family will love having all of their favorite movies and cds in one handy spot. Let the family fun begin. This media cabinet is shown in oak wood with our OCS-101 stain but many other wood and finish options are available. If you need extra DVD or CD storage then call to get a quote on a custom media cabinet. I love it, beautiful and well built.